Management (or managing) is the administration of an organization, whether it be a business, a not-for-profit organization, or government body. Management includes the activities of setting the strategy of an organization and coordinating the efforts of its employees (or of volunteers) to accomplish its objectives through the application of available resources, such as financial, natural, technological, and human resources. The term "management" may also refer to those people who manage an organization. Social scientists study management as an academic discipline, investigating areas such as social organization and organizational leadership. Some people study management at colleges or universities; major degrees in management include the Bachelor of Commerce (B.Com.) and Master of Business Administration (MBA.) and, for the public sector, the Master of Public Administration (MPA) degree. Individuals who aim to become management specialists or experts, management researchers, or professors may complete the Doctor of Management (DM), the Doctor of Business Administration (DBA), or the PhD in Business Administration or Management. Senior managers, such as members of a Board of Directors, a Chief Executive Officer (CEO) or a President of an organization, set the strategic goals of the organization and make decisions on how the overall organization will operate. Senior managers provide direction to the middle managers who report to them. Middle managers, examples of which would include branch managers, regional managers and section managers, provide direction to front-line managers. Middle managers communicate the strategic goals of senior management to the front-line managers. It includes directors, associate directors and assistant directors in the large libraries. They are responsible to set policies for the entire organisation and are responsible for its overall management. They act as leaders and have wide powers as wells responsibilities. They are in–charge of specific sub-units of the organization. 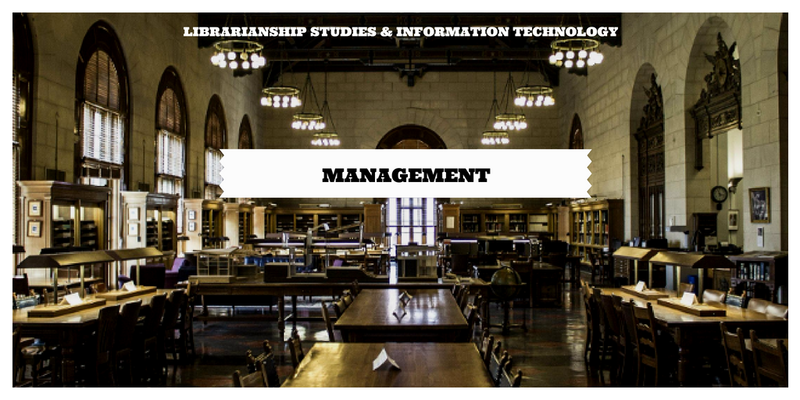 In the libraries, they are heads of the department or Branch Librarians. Their responsibilities are confirmed to the successful functioning of the department concerned. They also serve as liaisons between top management and supervisors. They act as supervisors of the junior staff and lead the activities of individual workers in carrying out the day to day work of the organisation/library. These managers implement the procedures and processes that allow their units to work effectively and efficiently. But the above mentioned hierarchy in the management is being distributed more widely throughout the organizations these days. This change can be seen in all types of organisations including libraries and information centres. The emphasis is being given to team work now-a-days.